Nestled between I-77 & I-81 in SW VA, we have sparkling restrooms, a new laundry, heated pool, free WiFi and cable, and pull-thru sites (no rig too big!). Rental cabins overlook the pond. Easy in & out from interstates. Very friendly and helpful people . Great location and stop over for heading south easy on and off 81 & 77. We stayed and extra day to tour the blue mountain area back roads which was great to do in our toad. Fort Chiswell is an excellent facility to stay overnight in. It is very close to the I-77/I-81. The facility is clean with no problems handling a big rig. Highly recommended. Quiet evening and excellent satellite reception. We plan to use this place as our stopping off point when heading south. Campground is very accessible for all types and sizes of RV's, easy parking, very good LP prices, close to gas, fuel, restaurants, and wineries. Laundry facilities are inexpensive and clean. Stayed for four days on our way home from Florida. 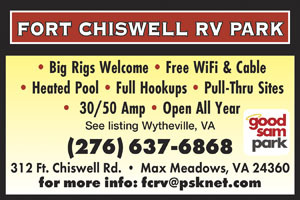 We stayed at Fort Chiswell RV Park for one night on our way to SC. Very friendly staff. We liked the fact they had propane on site. Pull thru site was convenient (concrete level pad). The full hookups were well placed. 50, 30 and 20 amp electrical service. We would stay there again when passing thru. stayed one night on our way north. very easy to get in and out. close to fuel. would stay on the way back. This private park is very organized, great signage and kept up well. It is very busy and popular. That said, there isn't much there in terms of scenery--next to farm fields. I cannot believe that this campground has this high of a rating from Good Sam! It may have been a great park at one time, but there is little appeal here. There are too many long term campers. There was so much smoke, that you could hardly breathe. The sites were so close together, it was awful. It was very hard to get around in a big rig. Very rough roads, dirt, gravel site that was difficult to level. I would not stay here again. This is an excellent campground for a convenient overnight stay as it is just of I81 and next to a Flying J gas station. Essentially 3 areas of the park; 1 is tree shaded, 1 is open air and the third is more overflow. The restrooms are very clean and the laundry is large and clean. Very friendly staff. We could very easily navigate with our 25 foot trailer and pull vehicle. Camped at site #7, a pull through site with a 32’ 5th Wheel. The sewer connection needs replacing as it is broken (PVC). Connections are very convenient. Cable has a lot of snow and noise (video and audio) but can still view the stations (50+ channels). The owner is very nice and filled up my propane bottle while checking in. Nice convenience store. Nice spacing for a large number of spaces...you don’t feel too close, but do have neighbors. 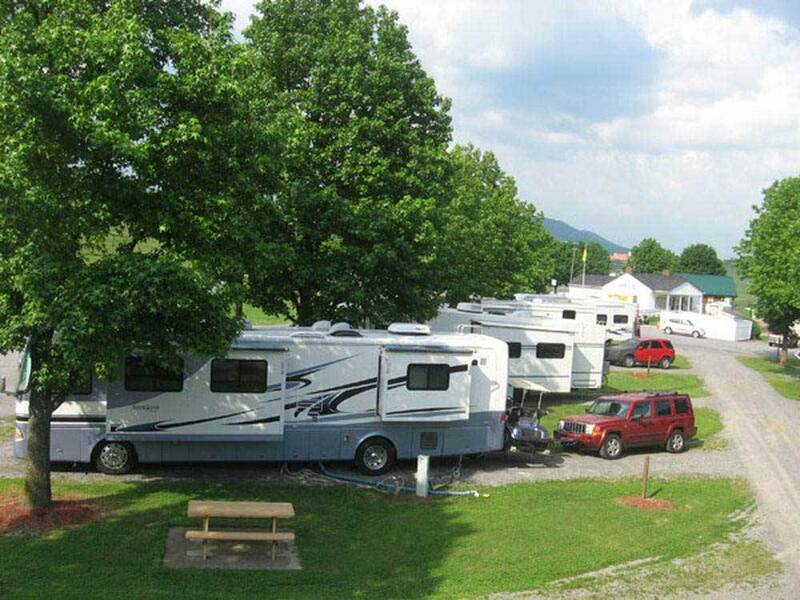 Very nice looking RV Park and large rigs can maneuver well. Flying J truck stop nearby just off I-81 and the park is just off the interstate. We did not use the restrooms or showers. Staying here one night only, and it is just as advertised. Beautiful, country RV Park. Several big rigs in the front, where we parked. Level site with lots of grass. The spaces are close together, but that is fine with me for an overnight stay. The pool is large; however, we didn't endulge. The bathhouse is extremely clean, as is the rest of the park. Lots of couple out walking this evening. We were greeted with a friendly young man in the office who told us everything we. Ended to know. I asked for a level pull thru site when I made my reservation, and that's what I received. 52 Cable channels, and they all work! Wifi is sketchy; good signal for a bit and then not so much. But, that's the way it usually is at an RV park, right? For an overnight stay, this place is perfect. Actually, it would be nice to say a couple nights, but we are headed to Pigeon forge in the morning. There is also a nice store at the office. Hookups all hooked up easily. We will return when in this area. Easy access for big rigs like ours. Nice level pull through sites. Easy access right off Highway 77. Great dog walking areas. Campground was very clean. Near a grocery store and hardware store. We would definitely stay there again. This is a nice park, the sites are level and we had a pull thru, so it was easy in and easy out. The restrooms were the cleanest I think I have ever seen, especially with some age on the building, you will sometimes see old dirt in cracks and crevices, but not here. We really enjoyed walking our pets on the park grounds. They have a pond that have some very large koi in it that would be fun to feed, I'm not sure if they sell fish food for that or not. There are hills that surround the park with some cattle on one side, kind of relaxing to watch. They have a nice pool area, there is also a playground area, with equipment that is dated, but still a place to swing or run around if you have kids that need to blow off some energy. There is a nice selection of RV supplies in the store and they have a large book exchange. They have a large building with the laundry in it and a huge sectional sofa in the attached room, so you could just hang out while you do laundry if you wanted. This is a nice park and we would stay here again. A great choice if you need a quick break from the interstate--literally 2 minutes from the ramps for 81 and 77. Park is laid out in straight-forward block pattern with mostly pull through sites. Very clean and well kept. However if you are planning to stay awhile and are looking for conviviality with other campers, look elsewhere. Most of the slots are filled with overnighters who are intent of getting in, getting rested and getting out in the morning. Not a lot of socializing. Was an older park, restroom and showers were clean and good enough. Used a shower curtains, not great but it worked. The site was good, a little unlevel, but not terrible. Pool looked good, not much else to do there, but as a one night stop was good enough. We are snowbirds and stay at the park twice a year. We normally stay 2 nights midway through our trip. The staff are very nice and helpful. Location is good, and pads were well drained after heavy rain. Only negative is that restrooms are situated a good walk from most sites. Wifi a bit slow. But price is good snd scenery is rural. Very dog friendly! great camp site level gravel site in the middle of farm country. Close to the highway without the noise from the highway. Great price also. Stayed one night while traveling from Asheville, NC to Shenandoah National Park. Not even a mile off the interstate, but large hill stopped all highway noise. Mostly pull thru sites so very nice for a one night stay. Gravel sites and drives. Staff was pleasant during reservation and check in. Great park for overnight stop or a few days. Sparkling clean restrooms. Nice little store. Big rig pull through sites with great utilities. TV was not great Wifi was ok. Close to the highway but no noise. Pool was closed as it was October. Reasonable price with Good Sam discount .. Would definitely stay here again. Great campground if you are just passing through. Not really a place to stay for more than a night or two. One thing we enjoy is a campfire at night. No fire rings here. But the facility is great, easy in/out and fantastic bathhouse. Easy access to Interstate, Easy access to sites, many pull thru with trees. Country setting & quiet. Plenty space to walk pets. Swimming pool & play ground away from campers but easy walk for children. Stayed extra days for relaxation. Would definitely return. Although close to Interstate, the hills block all road noise. Men's Restroom might not have the newest fixtures but it's the cleanest - the floor sparkles. Sites are close together but for a short visit it was OK. Surrounding hills are used for grazing herds so depending on the wind direction there is an "aroma" that comes from the herd. Yes, organized & friendly staff..........and would return if in the area. Mgr was friendly and helpful place was very clean did laundry sign said 7:00 was latest, Mgr said we could finish.We will definely stay there again. Stayed one night. Nice campground. Staff nice. Pull through sites are fine, back-in sites (28-38) along south end of property are all gravel (no trees) and not very appealing. Cable system could use some upgrading. People very friendly, good doggie walking areas (would be better if EVERYONE picked up after their pets). Would definitely stay again. Cable was poor, needs upgrading.